It’s time to celebrate the 200th anniversary of the world’s biggest beer festival, Oktoberfest! Obviously pets should never be given alcohol but that doesn’t mean they have to miss out on the party – we’ve got a whole range of Bavarian accessories and special offers for dogs, cats and small pets! 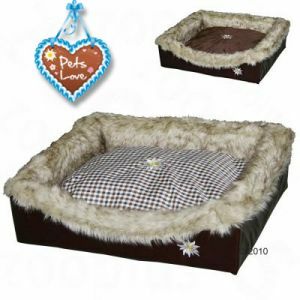 The Dog Bed Edelweiss is beautifully designed and will add a touch of rustic, Bavarian charm to your home. The reversible cushion means you can choose from the traditional checkered or a classic brown depending on your mood (and perhaps how muddy your dog is!) The super soft, faux-fur edging will keep your dog snug and warm no matter how cold it gets this winter. This Cat Toy Fish is designed to give your cat a truly stimulating play session! Her feline senses will be on full alert with feathers and ribbons to pounce on and chase as well as added cat nip to make the toy irresistible. 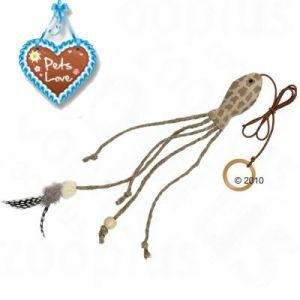 The long rubber cord will keep your fingers out of the way of stray claws while your cat enjoys the thrill of the hunt! Our JR Farm “Brotzeit” Snack Board is a true Bavarian feast for small pets! 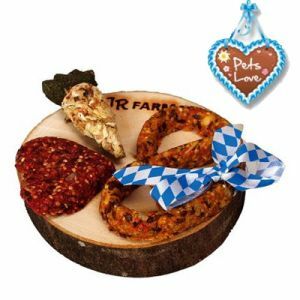 Your small furries will love getting their teeth into these Oktoberfest themed and 100% natural treats and when the biscuit heart, pretzel and parsnip snacks are gone there is always the natural wooden bowl to nibble on! This entry was posted in Cats, Dogs, New Products, Small Pets by emmas. Bookmark the permalink.